Builds on Recent Pledge to Integrate Sustainability into All New Products This Year, Joins RE100, Partners with Xcel Energy, Inc.
ST. PAUL, Minn.--(BUSINESS WIRE)--3M CEO Mike Roman today announced the global manufacturing and technology company is committed to move to 100 percent renewable electricity in all its facilities around the world, beginning with its own headquarters tomorrow. 3M becomes the largest company in Xcel Energy Inc’s service area across eight Western and Midwestern states to convert to 100 percent renewable electricity. 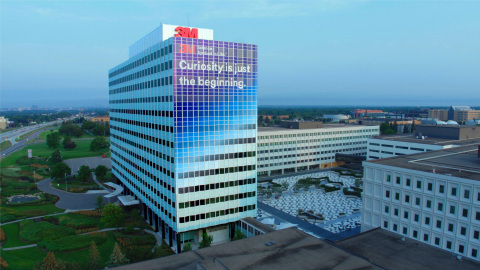 3M’s St. Paul global headquarters is a 409-acre campus with about 12,000 employees across 30 buildings and research labs. 3M’s transition to 100 percent renewable electricity at its headquarters will increase the company’s total global renewable electricity sourcing by more than 5 percent to approximately 30 percent and further help the company reduce greenhouse gas emissions. 3M has recorded a 68 percent absolute reduction in greenhouse gas emissions since 2002, while nearly doubling its revenue. “We applaud 3M’s leadership in making a bold commitment to 100% renewable energy. Xcel Energy is proud to partner with 3M, because we both share a drive to innovate and a commitment to reducing carbon emissions and protecting the environment,’’ said Chris Clark, president, Xcel Energy-Minnesota, North Dakota, South Dakota. Committing to 100 percent renewable electricity is part of 3M’s strategic focus on science for climate with the aspiration to innovate to decarbonize industry, accelerate global climate solutions and improve the company’s environmental footprint. As part of the global goal, 3M is joining RE100, a global leadership initiative, led by The Climate Group in partnership with Carbon Disclosure Project (CDP) that brings together influential businesses committed to sourcing 100 percent renewable power for their worldwide operations. 3M is committed to the move to sourcing 100 percent of electricity from renewable sources and has set an interim target to source at least 50 percent of its electricity from renewables by 2025. As a global manufacturing and technology company that produces thousands of diverse products, 3M is committed to accelerating global renewable energy adoption and to transparently sharing progress along the way. 3M also recently announced an increased commitment to build Sustainability into the pipeline that produces its thousands of products and technologies. At the UN Climate Conference (COP24) in December, 3M introduced its first formal requirement that a Sustainability Value Commitment be included in all new products introduced beginning in 2019. At the same time as 3M converts its operations to wind and solar power, the company continues to support the global renewable energy sector by producing solutions for customers that improve the reliability and efficiency of renewable energy, including solar and wind. Last year alone 3M’s products helped customers avoid more than 13 million tons of greenhouse gas emissions. 3M has been a strong and committed business citizen in the State of Minnesota for more than 116 years. The announcement represents an important milestone in 3M’s valued partnership with Xcel Energy. The majority of the power for 3M’s headquarters will be supplied by Xcel wind farms located near Pipestone, Minnesota. Additional electricity will come through the wind projects that are part of Xcel’s Windsource program and solar sources. 3M has been a leader in environmental sustainability practices for decades. In 1975 we instituted our Pollution Prevention Pays program that has prevented over five billion pounds of air, water and waste pollution and has created $2.2 billion in savings. 3M’s ambitious 2025 goals include reducing water usage, impacting climate and energy targets. The company has been listed on the Dow Jones Sustainability Index for 19 consecutive years.